↑ Typhoid Mary: An Urban Historicalpublisher=Anthony Bourdain. Hardcover. Bloomsbury, New York. 2001: pp. 148 [2011-7-14]. ISBN 1582341338 . ↑ 2.0 2.1 Typhoid Mary. about.com [2011-7-14] . ↑ Judith Walzer Leavitt. 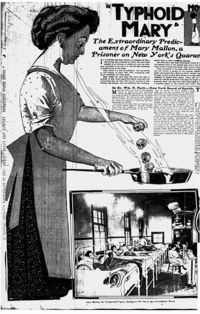 Typhoid Mary, Captive to the Public's Health. hardcover. Beacon Press, Boston. 1996: pp. 331 [2011-7-14]. ISBN 0807021024 . ↑ Federspiel, J.F.. The Ballad of Typhoid Mary. New York: Ballantine Press. 1985 [2011-7-14] . ↑ Sara Josephine Baker. Fighting for Life. 1974 ed. New York: Macmillan Press. 1939 [2011-7-14]. ISBN 0405059450 . ↑ Gregory P. Campbell, The Global H1N1 Pandemic, Quarantine Law, And The Due Process Conflict, 12 San Diego Int'l L.J.497, at 508(2011).